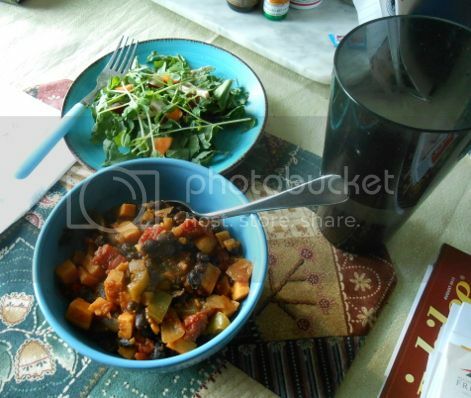 This recipe combines two of my favorite things: sweet potatoes and chipotle chiles! Like a lot of the things I wind up throwing together, it grew out of a craving for a particular flavor combination that couldn’t quite be satisfied by cookbooks or Google searches. I suspect that I was thinking of the sweet potato/brussels sprout chili in Appetite for Reduction when I was putting it together, and it also has echoes of a chili that appears in a couple of Robin Robertson’s books as a fall sort of dish. 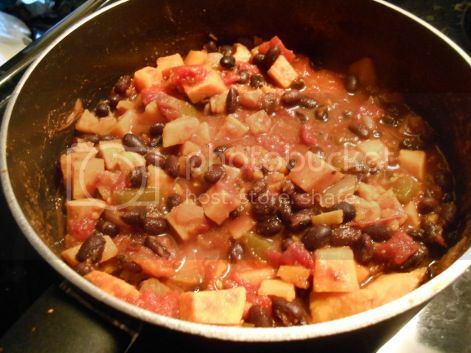 It even has a fall-ish look to it, with the sweet potatoes and beans giving it an orange and black theme. The rest of the ingredients are pretty much standard chili fare, and the whole thing comes together in one pot. Which, as you may remember, I’m quite fond of. The end result is a well-seasoned, warming chili that has just enough spice and smokiness to make it enjoyable without sending you through the ceiling. You can serve it over (or with) pretty much anything that would balance out the spices. I went for brown rice, but a good plain cornbread would also do the trick. Hungry yet? Check out the full recipe over at One Green Planet!